Click the ‘Sign up’ registration form on the top right hand menu and fill out the registration form. When a candidate clicks on the ‘Apply’ button of a job listing they will then be taken to the application form. This form is written by Winemasons.com staff and is not editable. The application form asks the candidate to write a cover letter, attach either a pdf resume or submit their online winemasons.com resume. They will also be prompted to answer some key questions including country of passport and whether they have any criminal convictions. When the application form is submitted, a notification email will be sent to the candidate and also to the employer to confirm their application has been sent/received. All applications will be saved to the employers dashboard. When you login to your dashboard you will be able to manage your jobs and view any applications that have been sent. Step 2 is a preview where candidates can see how the resume will look. From then they can click back to edit the resume further, or click submit to go to step 3 where a confirmation is displayed. The candidate has the option to click the ‘pdf’ button to download their online resume in pdf format which they can use to apply for any other jobs. Job Alerts is a service available to all logged in candidates. When they log in, an alerts management page can be viewed where you can add, preview, enable, disable, edit and delete email alerts. 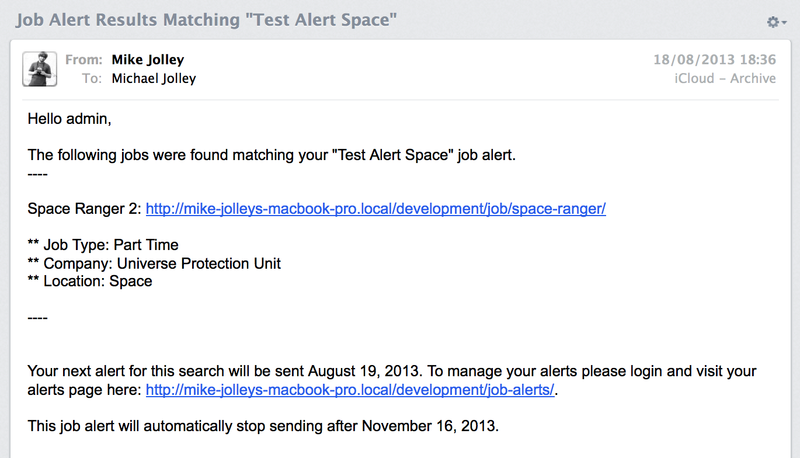 Alerts can be configured based on keywords and job types. Using the job filters to search for jobs? If you are logged in, you can save your search as an alert using the ‘add alert’ button. Email alerts can be configured to be sent with several different intervals. Alerts are sent in plain text format and list all matching jobs posted during the interval. Employers can list jobs easily from the frontend. The forms allow employers to input job details, including job description and location, and also add details about their company. Each listing can be assigned either an email address or an external website link which job seekers can use to apply to the job. Employers can preview their listing before it goes live. The preview matches the appearance of a live job listing. After preview, the employer can submit the listing or edit it further.